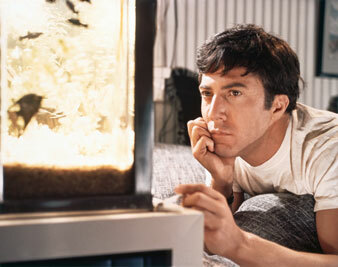 Everett Collection Dustin Hoffman in The Graduate, 1967. Stars: Dustin Hoffman, Anne Bancroft, Katharine Ross, William Daniels. Dustin Hoffman chooses Mrs. Robinson over plastics. Who wouldn’t? The roaring success of Mike Nichols’ The Graduate is hardly surprising—he has built it on the dependable formula of Restoration comedy. I would not raise hopes too high: this Way of the Affluent World, to a script by Calder Willingham and Buck Henry, is consistently funny and frequently ironic, but it quite lacks the aphoristic wit of Sheridan or Congreve, and as it wears on it forsakes cynicism for chase and begins to resemble more Harold Lloyd than Mayfair dandy. Still, the spice of the piece, the source of its tension and laughter, is the confrontation of jaded maturity with the demanding innocence of youth. “Never trust anyone over 30” is a slogan that could have served the Restoration as well as it does our own time, and Nichols makes the old formula seem as topical as mini-skirts. Youth wins because its nerves are stronger and its needs simpler; it is not really a moral victory, but it serves that purpose. If Nichols grasps but cannot hold the style of his model, it is because his older actors let him down. Dustin Hoffman has the light manner as the highly moral and readily seducible Graduate; he is at once gauche, disconcertingly direct and well armed by incredulity against the ploys of his elders. And Katherine Ross, as his destined sweetheart, is properly flouncy in a somewhat dim-witted righteousness. But Ann Bancroft, the seductress, invests a little too heavily in her lechery, and in general the attendant parents, spouses and family friends put too much heartfelt venom into what is essentially a masque of animal spirits. As a result, the film keeps threatening to turn the corner from Belgrave Square into Peyton Place. Of course, I may be saddling Mr. Nichols with my own concept of his purpose; it is quite possible that he gave no thought at all to the 18th century and had in view no more than a cautionary tale for the 1960s. In that case, though, it is odd that his picture is so much more effective when it is outrageous that when it is outraged.